Inflammation occurs when the white blood cells in the body work hard to fight against foreign substances such as toxins and chemicals, and pathogens such as bacteria and viruses. It's a normal body function to protect the body from outside invaders. While the white blood cells are fighting foreign "invaders", chemicals are released into the blood and body tissue. As a result, swelling usually occurs, and so does irritation and pain. Acute inflammation occurs suddenly, maybe due to an injury. On the other hand, chronic inflammation occurs on and off over a period of time. In addition, inflammation can occur internally in various body organs, and that's more difficult to detect. While inflammation is a normal process for the body to get rid of foreign invaders, it becomes a problem when inflammation gets out of hand and becomes chronic. Chronic inflammation leads to a host of diseases, some serious. Some examples of canine diseases caused by chronic inflammation include diabetes, obesity, heart disease, cognitive dysfunction (Alzheimer's), and even cancer. 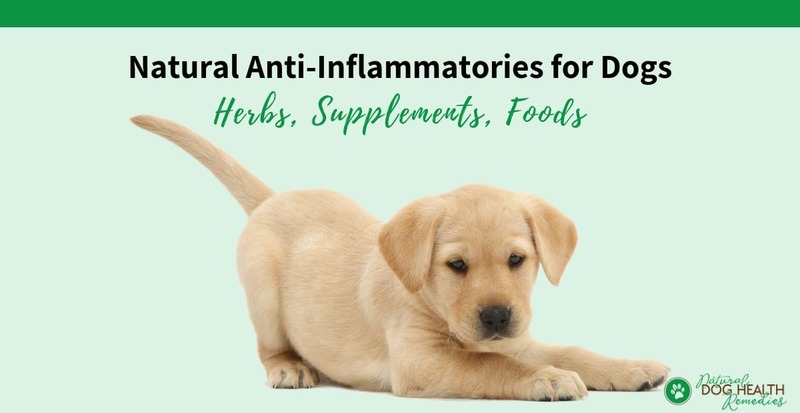 Since conventional anti-inflammatory for dogs could cause numerous side effects to dogs, more and more dog parents are looking for a more holistic and natural approach when trying to help their dogs with inflammation conditions, especially chronic inflammation. Let's take a look at the options available for natural anti-inflammatory for dogs. Quite a few herbs have powerful anti-inflammatory properties. They can be used for a number of inflammatory conditions that commonly occur in dogs, such as arthritis and joint pain, GI issues (such as gastritis, IBD), and itchy skin conditions (such as eczema, dermatitis). Some herbs can also be used as part of a holistic cancer treatment protocol. Calendula: Calendula is anti-inflammatory and anti-microbial. It also has pain-relieving and anti-itch properties. It is commonly used to enhance liver function, and inhibit some tumors. Topically it is great for soothing skin inflammation and healing wounds. Cat's Claw: Cat's claw has anti-inflammatory, anti-microbial, anti-tumor, and anti-arthritic properties. It also has blood cleansing function. This herb can be used to treat arthritis and joint pain, stomach ulcers, or urinary tract infections in dogs. Chamomile: The herb Chamomile is anti-inflammatory and antiseptic. It also has pain-relieving and carminative properties. It can be used to help dogs with eye inflammation, skin irritations, sore tummies, gas, or indigestion. Frankincense: Frankincense is also anti-inflammatory. In addition, this herb has pain-relieving and anti-fungal properties. It also has blood cleansing function. It can be used for treating arthritis, colitis, diarrhea, and liver disorders in dogs. Garlic: In addition to being anti-inflammatory, garlic has powerful anti-microbial properties. It can also boost the immune system and repel fleas and ticks. Holistic vets suggest using garlic to fight bacterial and viral infections, enhance immunity, support the cardiovascular system, and to detox the liver. Not sure if garlic is safe for dogs? Be sure to click on this link to find out! Ginger: Ginger can relieve pain and spasms, and has antioxidative and anti-inflammatory properties as well. It is commonly used to help dogs with GI problems, such as vomiting, diarrhea, nausea. Topically it can relieve pain. Licorice: Licorice has powerful anti-inflammatory properties. In fact, it is considered to be as effective as corticosteroids in treating inflammation. It can relieve pain and is also an antioxidant. Because of its strong anti-inflammatory properties, this herb is widely used by herbalists and holistic vets to treat dogs with arthritis and joint pain, as well as skin issues such as itchy skin, eczema, and dermatitis. Neem: Neem has anti-inflammatory, anti-bacterial, anti-fungal and pain-relieving properties. It's good for dogs with skin irritations and inflammation, as well as itchy skin conditions. Sarsaparilla: This herb is anti-inflammatory and anti-arthritic. Holistic vets use this herb to help dogs with arthritis and skin issues such as eczema. Turmeric: Turmeric is another powerful anti-inflammatory herb with antioxidative properties. 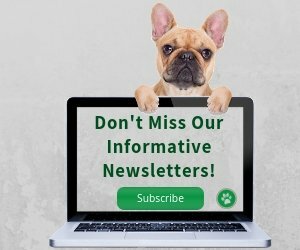 It is beneficial to dogs with GI problems (e.g. IBD, gastritis), joint pain and arthritis, skin issues (e.g. eczema), liver conditions, and even cancer. 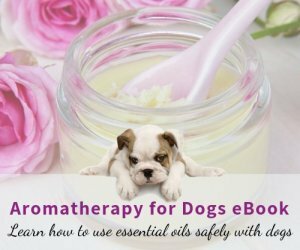 Many essential oils have anti-inflammatory properties and can be used topically to help relieve symptoms of inflammation in dogs, such as skin flare-ups, tummy upset, and joint pain. Not all anti-inflammatory essential oils are safe for use on dogs though! Be sure to visit my post on Anti-Inflammatory Essential Oils for Dogs for more information. Omega-3 Fatty Acids: The EPA and DHA contained in Omega-3 fatty acids have powerful anti-inflammatory properties. Supplementing your dog with oils rich in Omega-3 FAs (such as salmon oil, krill oil) can help keep inflammatory diseases in check. In particular, it has been found that EPA is effective in reducing inflammation associated with arthritis, alleviating symptoms caused by IBD, and supporting brain health. Coconut Oil: The lauric acid in coconut oil has been found to have great anti-inflammatory properties. In addition, coconut oil is highly antimicrobial and analgesic. We can definitely use coconut oil to help dogs with skin issues (such as allergies, itching), prevent and relieve pain caused by arthritis, improve digestion and help with stomach issues such as ulcers, IBD, and colitis. It also benefits older dogs as it helps improve brain function and may also reduce the risk of cancer. Resveratrol: You probably have heard of resveratrol, which is a powerful antioxidant. Research has found that resveratrol also has great anti-inflammatory properties. If you have an older dog, use this supplement to help prevent age-related health issues caused by inflammation, such as heart disease, cognitive dysfunction, and possibly cancer. Berries: Berries such as blueberries and strawberries are packed with nutrients and have excellent anti-inflammatory and anti-oxidative properties. It is so easy to give berries to your dog. For example, give them as is, or use them in home-made biscuits and frozen yogurt treats. Leafy Greens: Leafy greens such as spinach and kale contain a lot of goodies, such as flavonoids and carotenoids, which have strong anti-inflammatory and antioxidative properties. Try adding steamed or pureed leafy greens to your dog's food for the added nutrients and anti-inflammatory punch! Mushrooms: Shiitake mushrooms contain compounds that have the ability to prevent inflammation and inhibit oxidation. You can add shiitake mushrooms to bone broth for your dog. Here's a recipe for making bone broth for your dog. 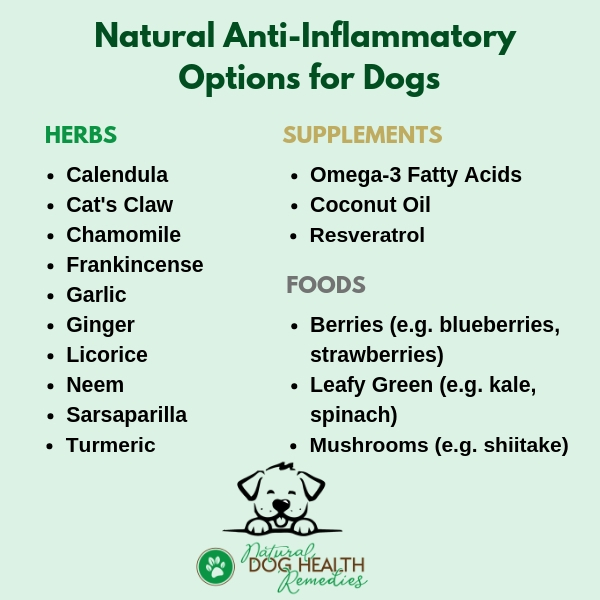 As you can see from the above, there are quite a few natural anti-inflammatory options that you can use to help treat or prevent your dog's inflammatory conditions. 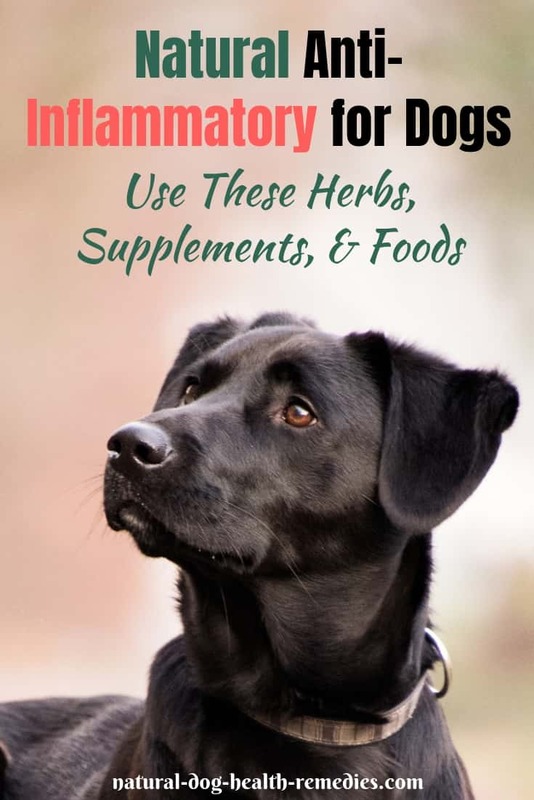 Which anti-inflammatory to use on your dog depends on factors such as the specific inflammatory condition, severity of the condition, your dog's age, and so on. While conventional drugs such as NSAIDs may not be as safe and gentle as natural anti-inflammatory for dogs, sometimes NSAIDs are necessary for quick relief of pain and discomfort. Natural rememdies such as herbs usually takes longer to see results. 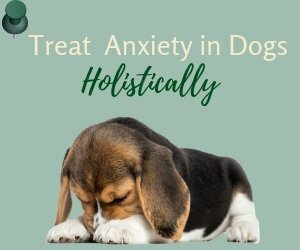 The most important thing is, work together with a vet (preferably a holistic vet) to come up with a holistic approach that works best for your dog.